Two weeks ago I had a design support tutorial with my tutor Hannah Thorogood. This spurred me on with writing up the design and was a great way of accepting and sharing feedback. We worked through an assessment sheet, looking at areas requiring work and discussing helpful suggestions for the next time I work on a design. I left feeling pleased with what I had achieved and with a clear plan of the stages I needed to complete. I have shared my design on this blog and via Facebook, so would be happy to receive feedback from anyone who feels they would like to offer me some! Now that I have completed the ‘Design’ stage of the action learning cycle, I move onto the ‘Do’ stage. So I have been busy developing an implementation plan. I have actually already began stages of the design. I have been considering this design since I completed my PDC in 2012, so I have been making changes in my garden with the design in mind. WORK COMPLETED TO DATE Spring 2013 – Raised beds created to provide additional growing spaces. Fruit trees planted and additional soft fruit bushes added. Autumn 2013 – Garden observations began to be recorded as monthly blog updates. Raised bed edges fixed and increased in height. Raised beds mulched for over the winter with chicken bedding, cardboard, chop and drop and compost heaps. January 2014 – Sectional chicken run created and old chicken run area reclaimed to be key hole bed. March 2014 – Fence panels mended and water capture and storage system created from the chicken shed roof. WORK PLANNED I have drawn up a basic implementation plan using tasks on post-it-notes. This allows me to shift the jobs around on the planner to create an adaptable plan that is flexible. I will probably also do a more detailed plan focusing more on the plants and when things need sowing, potting on, planting out etc. I just wanted to finish by sharing my daughter’s garden design. She presented it to me and asked me to put it on my blog! 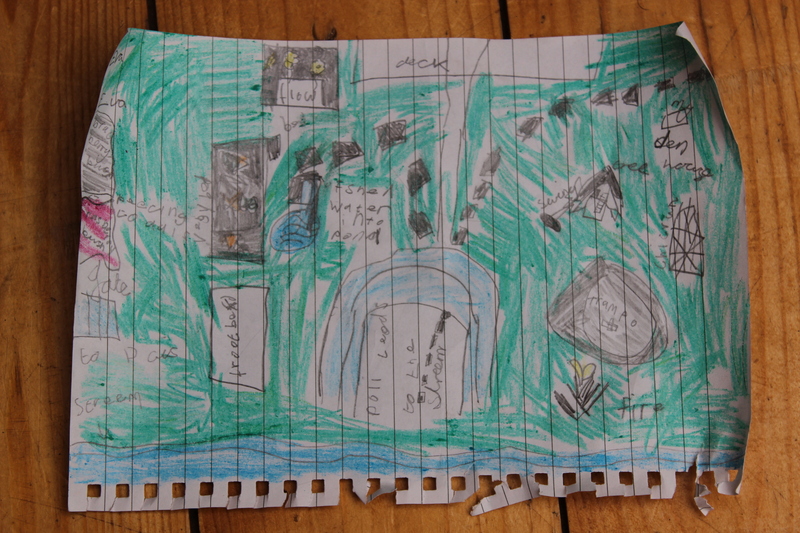 She has been inspired to create her own Permaculture design for the garden. I think it looks great, I am a proud mum. This entry was posted in Uncategorized and tagged 10 Designs, accept and share feedback, Design proposal, family, Implementation plan, My garden design, Permaculture, Permaculture Diploma by emilycrofton. Bookmark the permalink.